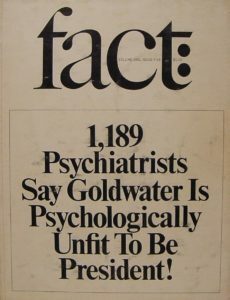 A 1964 issue of Fact magazine led to an APA ethical standard known as the Goldwater rule. John Dickerson published a full episode about this on his Whistlestop podcast. 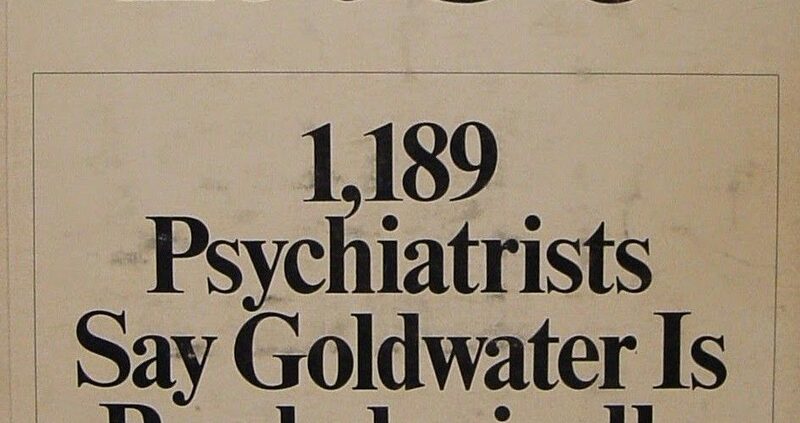 As a result of this story, the American Psychiatric Association (APA) agreed to section 7.3 of their ethical practices, known informally as “the Goldwater rule.” The rule says that psychiatrists can offer their expertise about issues in general, when asked about people in the public eye. “However,” they continue, “it is unethical for a psychiatrist to offer a professional opinion [about an individual] unless he or she has conducted an examination and has been granted proper authorization for such a statement” (according to Wikipedia). I wish clergy had such a rule for evaluating the “faithfulness” of presidential candidates. We can offer our expertise on issues, but it should be considered unethical for us to evaluate the faithfulness of individuals who have never been members of our congregations. Have we forgotten that God’s choice to lead God’s people is not a president but God himself? Paul and the early Christians alluded to it when they co-opted titles for Caesar and applied them to Jesus. Christians knew Caesar wasn’t a son of the gods as he claimed. Jesus is the Son of God. Caesar claimed to be king of kings, but they knew Jesus is the King of Kings and Lord of Lords. So, clergy and the rest of us Christians, can we adopt a version of the Goldwater rule for our very own? Like our colleagues in the APA, let’s expand it beyond presidential candidates, and apply it to all those with whom we disagree. Let’s also stop misplacing our hope in our favorite candidate.